This is either a new version of Captain Atom or a throwaway joke I’m taking way too seriously. 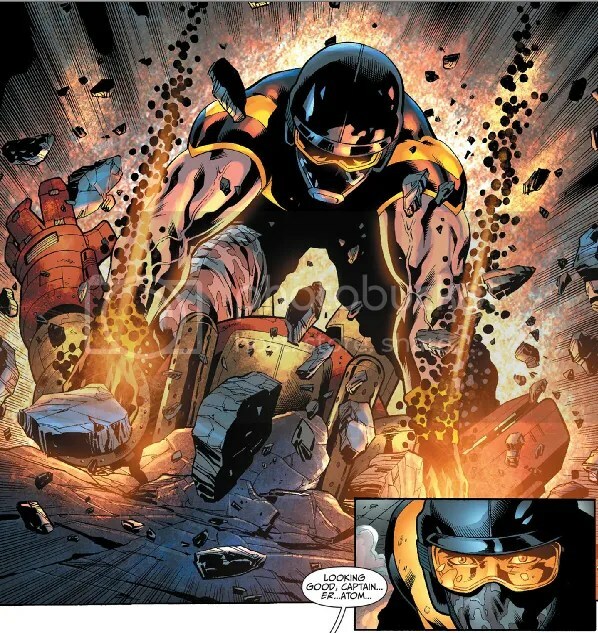 The character of Atom that we have seen in the pages of Earth 2 (issues 0, 1, 4-5, and 9) is Captain Al Pratt of the World Army. I never thought much about the character. The original Golden Age Atom was also Al Pratt, a pugilist who ended up with atomic-based powers (radiation immunity, superhuman durability, speed, stamina, and strength) and was a founding member of the Justice Society of America. In the New 52, the JSA has been moved back to Earth 2 (their pre-Crisis on Infinite Earths home). In the Earth 2 annual, we get the Atom’s origin story. He was a soldier for the World Army who somehow survived the epicenter of a nuclear explosion. He later found he was given atomic powers by the blast (he has the ability to deliver an atomic-super punch and can grow into a giant). The similarity between Captain Atom’s origin and the Atom’s origin are obvious. They both got their powers in a nuclear blast (to be fair, so did Firestorm). But this is not a new spin on the Atom, really. Although the Golden Age Atom started out as just a boxer, he did later survive nuclear fallout and found himself with new powers. Of course, this can be interpreted a few ways. Perhaps she was about to say “Captain Pratt” but caught herself in time (protecting his secret identity and all that). Perhaps James Robinson was having a laugh, breaking the fourth wall a bit and reminding us this is a comic book. Maybe this is the New New 52 Captain Atom. Maybe he’s just Captain Atom in name and nothing else. Maybe it is just a nod to Steve Ditko. Who knows? Well, James Robinson knows. And probably Dan DiDio, Geoff Johns, Jim Lee, and whoever else is running DC these days. And soon enough, the rest of us I suppose. I’m not the only one who latched on to this. Andy Hunsaker at Crave Online calls Pratt “Captain Atom” throughout his review (but is also quick to point out this is “not the Captain Atom you know”). I’m not going to give a detailed review of this book. It gets a mention on this blog because of the Captain Atom thing. He isn’t even the entire focus of the annual (see the cover). So that’s all the spoilers I’m willing to share. I will say, however, that Earth 2 Annual #1 was pretty damn awesome – art and story are top-notch. I am really enjoying the series. I give this annual an A.
I had not intended to review this book on this blog. It is a Captain Atom blog, and the only reason I let myself get away with this whole “Firestorm Appreciation Month” was because each of the books I reviewed featured Captain Atom. This book, this final issue of The Fury of Firestorm: The Nuclear Man, does not feature Captain Atom at all. But it does introduce Major Force into the New 52 continuity. And based on the fact that Force is working with General Eiling, it is a safe assumption that the New 52 Major Force is somehow tied in with the New 52 Captain Atom. So I decided to slap this issue up on my blog after all. I think that maybe that was Dan Jurgens’ goal all along, to trick me into reviewing his book. Anyway, this issue opens up at the Continuum, where Eiling is monitoring a battle between Firestorm and his rogues (Hyena, Multiplex, Killer Frost, Black Bison, Typhoon, and Plastique) on a monitor. This is a battle continuing from The Fury of Firestorm: The Nuclear Man #19. An aide tries to tell Eiling he has a visitor but the General is far too busy. Jason Rusch’s dad and Ronnie Raymond’s sort-of girlfriend Tonya drag Firestorm’s semi-conscious body into an alleyway (Ronnie and Jason, for the uninitiated, are the two dudes who combine to form Firestorm). The three are attacked by Hyena (which Tonya says is a werewolf – sort of a running gag with the character). Hyena is about to rip Alvin Rusch to shreds when a mysterious newcomer grabs his arm and throws him against a lightpost. It is none other than Major Force. Regular Captain Atom readers know Major Force all too well. An anti-hero of the worst kind, the modern age Major Force was created as part of the Captain Atom project in the 1960s. Unlike his predecessor Nathaniel Adam, Clifford Zmeck (Major Force) was guilty of the crime he had been accused of. And with his new-found powers he became even worse. Remember Green Lantern’s girlfriend Alex? 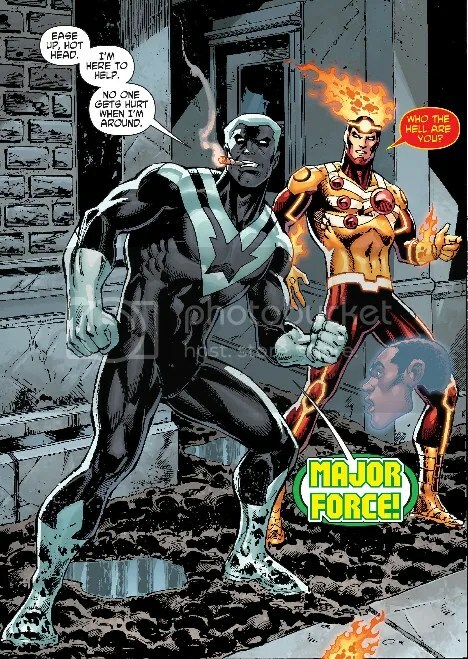 Major Force tells the now-conscious Firestorm that Eiling sent him to help. Firestorm doesn’t trust Eiling and Mr. Rusch warns the boys to be careful what they say to the government. Killer Frost attacks with a blast of ice. Back at the Continuum, General Eiling’s impatient visitor punches in a thick metal door. Major Force tells Firestorm to go see about the hostage (Ronnie’s mom) while he takes on Killer Frost, Black Bison, and Multiplex. Down on the dock, Plastique is holding Ronnie’s mom. As Firestorm approaches, he is body slammed by a tidal wave generated by Typhoon. But Ronnie is super pissed and one good punch sends Typhoon flying. Jason and Ronnie are formulating a plan to take down Plastique when Alvin Rusch clocks the villain from behind with a board. Firestorm and Major Force then take out the other rogues together – except for Multiplex, who manages to skip away. Major Force leads Firestorm to his ride, a military vehicle of some sort. Force asks Firestorm to pose for a picture, but the “camera” turns out to be some sort of neural shocker that knocks the boys both out. They come to (as Firestorm) at the Continuum, where Eiling, Stein, Superman and Major Force are arguing. Stein says he came out of hiding when he learned of the military’s plans for Firestorm, and sought the help of the Justice League. Major Force tells Superman that the two of them have no authority there. Superman flicks Major Force in the chest, sending him flying through a wall. 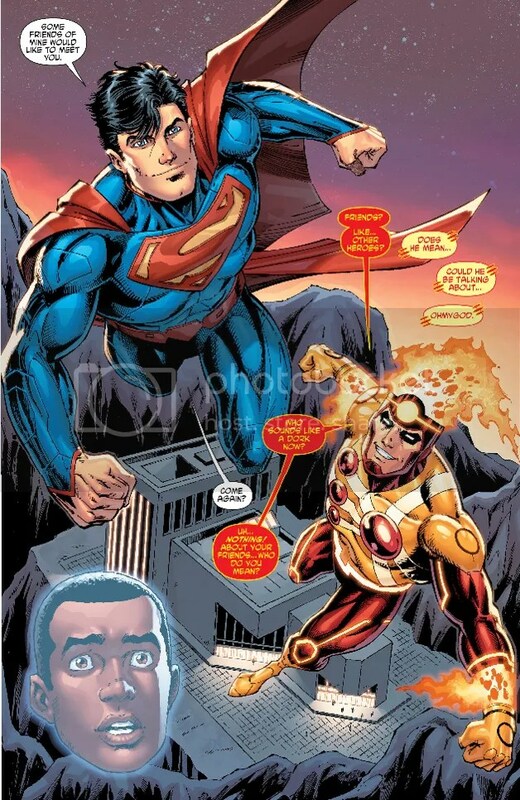 Firestorm and Superman leave together, with Superman offering Firestorm a position with the Justice League. And that is the end of The Fury of Firestorm: The Nuclear Man. Beautifully drawn and inked by Dan Jurgens and Norm Rapmund, the issue naturally left me wanting more. The story was wrapped up far too quickly (but to be fair, Dan had to condense a whole storyline into just a couple of issues). As much as I love Captain Atom and his universe, I think the New 52 could’ve done without Major Force. His new costume is better than the old one, for sure. But I never really was a fan of the character. Taking into consideration the rush job on the story, I give this issue a B+. That also wraps up Firestorm Appreciation Month at Splitting Atoms. Thanks for joining me. Thanks also to Luke Daab for the picture I used as an avatar this month, and a big huge thank you to The Irredeemable Shag for organizing and pulling off the social media event that was #FirestormFarewell. Put down whatever you are doing right now and go to your local comic shop. Today is the day for the final issue of The Fury of Firestorm: The Nuclear Man. All of the entries in the Splitting Atoms Blog this month have been Firestorm-centric in celebration of this amazing character (well, except for that one entry on Injustice: Gods Among Us #18). 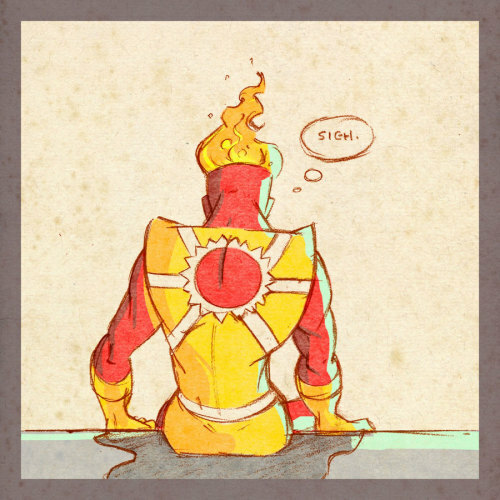 Always a fixture in Captain Atom’s life (and sadly cancelled too soon just like Cap himself), Firestorm’s solo title will be missed on the comics landscape. 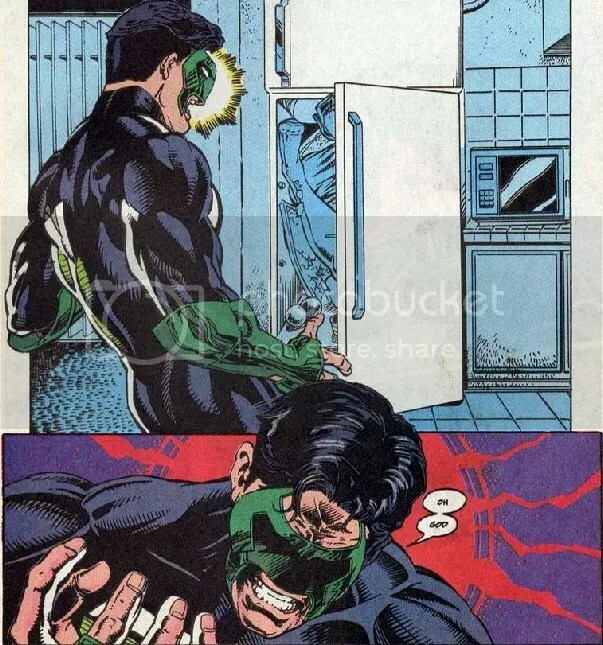 But at least he’s still in the Justice League! Hey Captain Atom fans. I’m doing something a little different this month. 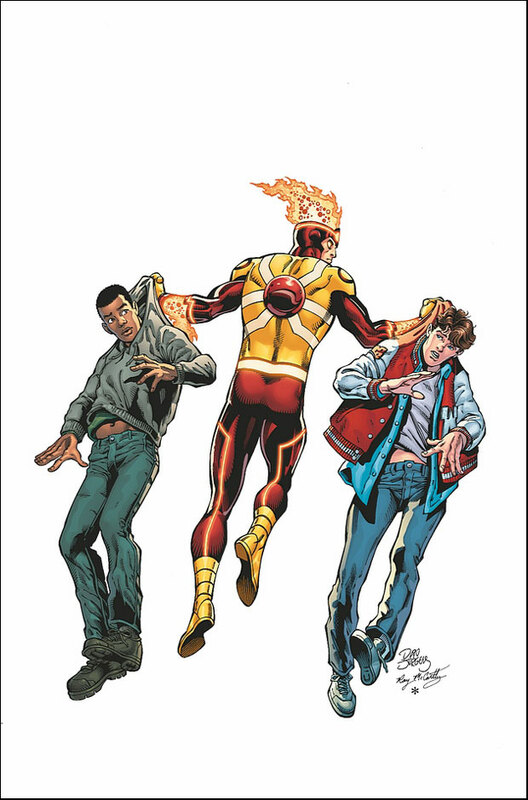 May 2013 will be Firestorm Appreciation Month on the Splitting Atoms blog. Why Firestorm? A couple of reasons. 1) Firestorm has appeared alongside Captain Atom so frequently over the years that I included him on the “Supporting Cast” page. Often when DC Comics would do their big crossover events featuring tons of heroes thrown together, Captain Atom and Firestorm were side-by-side (see The New Teen Titans #13, Crisis on Infinite Earths #7, Last Days of the Justice Society Special #1, Action Comics #596, Firestorm: The Nuclear Man #69, etc). It made sense, as they were the DC Universe’s two biggest nuclear-powered heroes. When Captain Atom first showed up on the DC scene in his own series, he and Firestorm butted heads pretty early on. 2) Much to my chagrin, the current Firestorm series has been cancelled, with the final issue coming out on May 22, 2013. It is particularly tragic (for me at least) because when Dan Jurgens took over the title with issue #13, the book quickly became one of my favorites. I honestly feel it is one of the best books DC Comics has out right now. I really wish they’d given Dan more time to turn the book around, but if the sales aren’t there they just aren’t there. We’ve weathered Firestorm cancellations in the past, and I am confident we haven’t seen the last of our resident hot-head. One of the podcasts I listen to regularly is The Fire and Water Podcast. It is a show devoted to Aquaman and Firestorm (an odd pairing but it works) hosted by The Irredeemable Shag (who runs a Firestorm blog), and Rob Kelly (who runs an Aquaman blog). Shag has asked all match-heads to use the below image as their social media avatar (twitter, tumblr, facebook, whatever) on May 22, 2013. It sums up how I – and many others – feel about the cancellation of this title. The drawing was done by Luke Daab. Now, this is still a Captain Atom blog. Each of the Firestorm comics I’ll be going over this month will feature Cap either fighting with (or just fighting) Firestorm. It will be a celebration of The Nuclear Man and I hope you all enjoy it. Okay, so I’m straying from Captain Atom for this post. This has been bouncing around in my head for a while now. Bear with me, or skip this entry to get on with more Captain Atomy goodness. 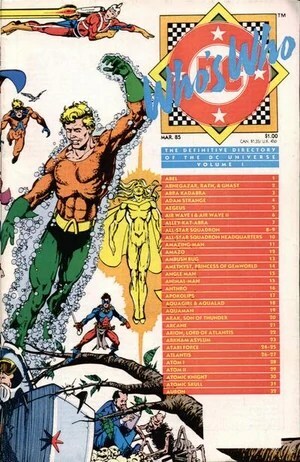 Who’s Who: The Definitive Directory of the DC Universe was a series put out by DC Comics to celebrate their 50th anniversary in 1985. It ran 26 issues from March 1985 to April 1987. There were a few update series released afterward, as well as spin-off titles Who’s Who in the Legion of Super-Heroes, Who’s Who in Star Trek, and Who’s Who in the Impact Universe. Each issue listed major (and some minor) characters in the DC Universe, as well as locations and other neat info. Usually, each character was assigned a single page which depicted them in an action pose and listed information about their history and powers. Some less-popular DC characters had to share a page with another character. The series was a personal favorite of mine and I am proud to say I own the complete run (the original 26 issues, all the updates, and the spin-offs). 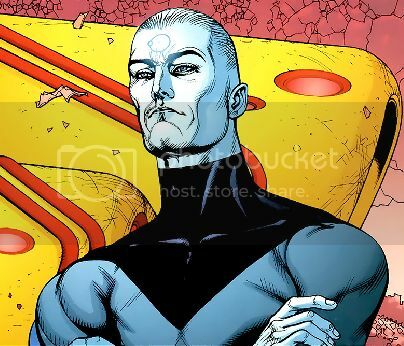 If you click on the “Captain Atom in Who’s Who” link at the top of the page, you’ll see an example of some of the artwork. Although I had a few issues of the title from its original run, I didn’t complete my collection until after I heard the first episode of WHO’S WHO: The Definitive Podcast of the DC Universe. The podcast first aired May 20, 2012 and I loved it instantly. The hosts are The Irredeemable Shag of www.firestormfan.com, a blog devoted to Firestorm, the Nuclear Man (sometimes-friend, sometimes-enemy of Captain Atom) and Rob Kelly of www.aquamanshrine.com, a blog devoted to Aquaman. Together, they also host The Fire and Water Podcast where they geek out about their favorite super-heroes on a semi-regular basis. The Who’s Who podcast actually comes in on the Fire and Water RSS feed. 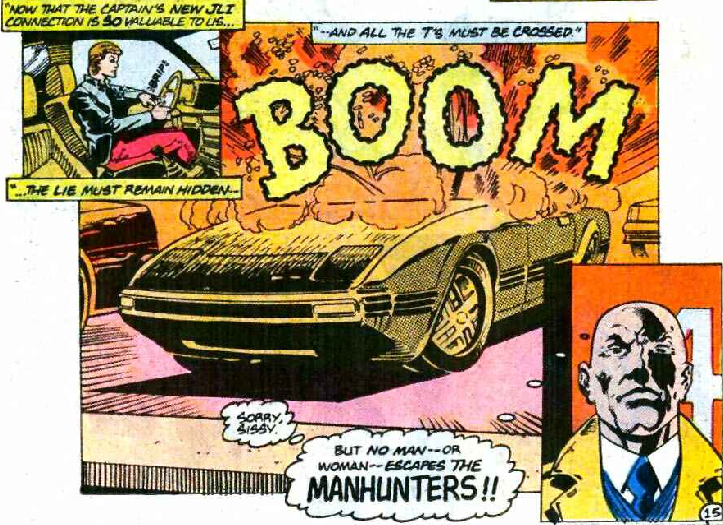 Each episode is devoted to a single issue of the series. They describe the pages in such a way that you don’t have to have the issue in front of you – but it helps. To describe it, the podcast doesn’t sound particularly compelling. But these guys are true comic nerds (and I mean that as a huge compliment) who truly love great work by great artists (particularly José Luis García-López [Praise Be His Name]). I was a turned on to The Fire and Water Podcast by my life-long pal and co-host on my own podcast, Roy “Charlemagne” Cleary. Growing up in the 70s and 80s I knew who Aquaman was thanks to the various incarnations of the Super-Friends. 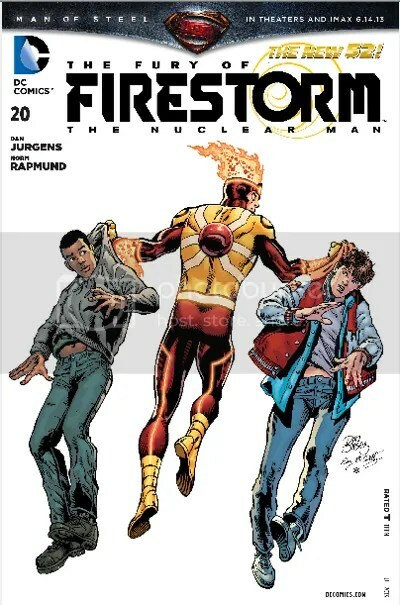 Firestorm I knew primarily because of Charlemagne. I read the title briefly from 1987-1988 when John Ostrander was writing it. I liked Firestorm but never really took to Aquaman. I thought at first it was a strange mash-up for a podcast, but it works (of course, it helps that they both currently have their own ongoing titles). It was Shag’s passion for the character that drove me to add the series to my pull list. Since Dan Jurgens has taken over the book, it has become one of my favorites. As I said, I never cared much for Aquaman, but respect his place in the DC Universe and he is my wife’s favorite super-hero so I won’t bash him. When I heard that first episode of the Who’s Who podcast, I was impressed. As I said in my iTunes review, the podcast itself is as ambitious as the Who’s Who series was. I love the way Shag and Rob play off each other and their good-natured (I hope) ribbing of each other. But most of all, their love of the art and the effort put forth by the creators of this series really shines through. They have a lot of fans, and deservedly so. And I can think of no better duo to dissect the Who’s Who series than these two. I listen to a fair handful of podcasts, and this one is always first on my list. When it shows up on my iTunes, it is like Christmas and my birthday all rolled into one. And the theme song is catchy. And there’s more to Rob Kelly than just Aquaman and Who’s Who. He is a graduate of the Joe Kubert School of Cartoon and Graphic Art and co-creator (along with Dan O’Conner) of Ace Kilroy, a comic strip about a 1940s era secret agent. He won a 2012 Philadelphia Geek Award for Comic Book Writer of the Year and Ace Kilroy was nominated in 2012 for Eagle Award’s Favorite Web-based Comic. Shag, on the other hand… I’m pretty sure he’s just got Firestorm on the brain 24/7. I joke but it was a lot easier to find info on Rob online than Shag. I’m not even sure what the dude’s last name is and that is probably by his own design. I definitely recommend this podcast to anyone who love comics, loves DC comics, loves Firestorm and Aquaman, loves nerds, loves nerd fights, and loves to see two titans one-up each other with their knowledge of the art and industry. Honestly, I wish I knew even 1% of what these guys know. You can subscribe to WHO’S WHO: The Definitive Podcast of the DC Universe on iTunes or Stitcher. Just look for The Fire and Water Podcast and you’re on the right path. Also, you can find them on tumblr, Facebook, and Google Plus. They also have their individual sites for Firestorm and Aquaman as well as a site for their original podcast.